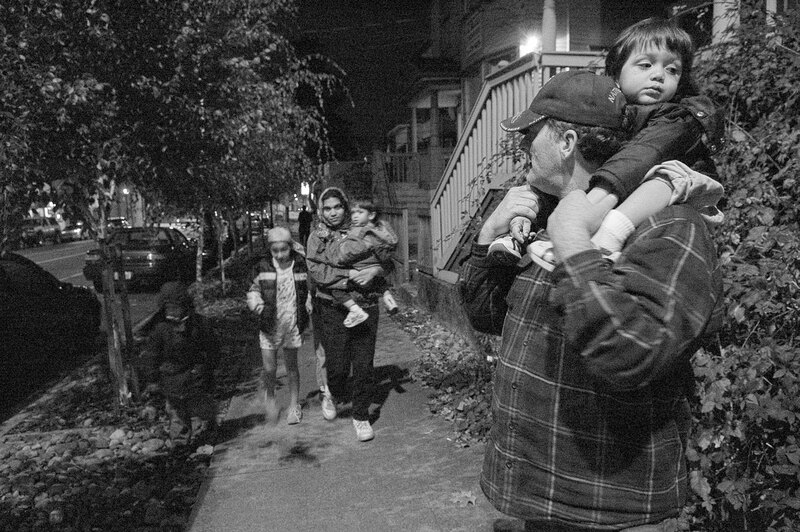 Angela and Leonard DeClue, (who is disabled from a long-ago agricultural accident) and their four boys, Jeremaih, 9, Alexander 5, and twins Sean and Darren, 2, became homeless after a dispute with a landlord and spent two weeks in the program at the Family and Adult Service Center in Seattle, basing themselves at the FASC facility by day and sleeping on the floor of a Ballard area church at night. In early November they were accepted at the YWCA Seattle Emergency Housing facility in Seattle's central district. They can stay at this facility for one month while they seek more permanent housing. They were photographed at the FASC facility dining and attending a mentoring session, then traveling on the bus to their temporary housing, where they played Play Station before putting the children to bed.